Yes that's right its been a busy year and one I have thoroughly enjoyed. Its been awhile since I last created a post so I won't even try to catch up on everything just a few highlights. 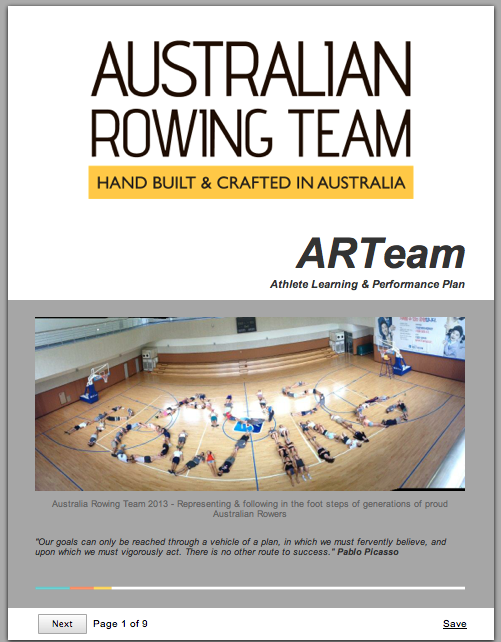 Being part of the many changes with the Australia Rowing Team through my role as Head Coach. Developing some great relationships with other National coaches that I am learning greatly from. Obviously my role is to help lead our direction and setting the strategy with the High Performance Team has me involved in being the connector to our National Coaches. Watching and seeing in 12 months some great advances in our athletes group. We now have some solid performers as key benchmarks in each of our categories. This was seen at the recent Dec TT's with many athletes and crews positioning themselves at the front of each category with very credible performances which show some positive trending. Having our Category Lead Coaches take up the challenges of planning and leadership with each of their categories. This is a great initiative and one I feel will make a great difference as we continue forward with categories like our ParaRowing, Women's Sculling, Men's Sweep, Women's Sweep, Men's Sculling, Men & Women's LWT Sculling and Sweeping. We are about to go live with out Athlete Learning & Performance Planning.. Yes this has taken some work behind the scenes and many contributors and finally we are close to launching it with our Athletes and we serve as a platform for further reflection, analysis, action and sharing and collaboration between athletes and coaches. Another highlight has been working with some great people at Rowing Australia. Its been amazing with working with Chris O'Brien in our different roles and to be again working with Jaime Fernandez who I rowed with way back in 1995. Wayne Diplock was a 1992 Olympian in the eight with Jaime and its been great working with him in the HP Team, with Chris and Jaime. Add to this all the people from the RA centre in Canberra who make everything happen. Plus we have a unique situation with all the key State Institute Head Coaches and staff involved in rowing, its amazing the network of people which reaches out through coaches, athletes, states, clubs and all the providers of services like medical, physio, sport science, S&C, massage and the list goes on. Being part of this is pretty bloody amazing and unique. My final two highlights are being able to enjoy the precious time with my family when home. Our kids are growing up so fast and I have traveled a lot this year but the reward has been when home just making the most of the time together. Recent we got the kids new bike and I found myself in the park near by in St Kilda with my wife just watching them ride around and around. I joy was a pleasure to watch. My wife has been an exceptional support through this last year. Its strange and exhilarating to think we have been married since 1999. Finally 7 weeks ago I made a decision to get my self fit and health again. With all the travel in 2013 I was starting to feel physically poor. The contrast to being an athlete training daily had increased and so I decided a change was required. I set my mind to getting back on the bike and thought simply I just need to get a routine going and break the back of feeling unhealthy. The first two weeks was the hardest but after those two weeks of 500km's I was away and have since settled in to a routine of 450-550km per week with 12 - 16 hrs of activity. I now feel heaps better and am loving being back on the bike.